Rotary Global Rewards —a new member benefit program that offers discounts on products and services like travel, hotels, dining and entertainment. Rotary Global Rewards is designed to make membership even more rewarding for Rotarians and is an exciting way Rotary can give back to those who give so much. Rotary global rewards help Rotarians: do more good work by helping with savings on truck rentals, airfare, or hotels; build strong relationships with fellow Rotarians with dining and entertainment offers; help you in sharing the story of Rotary over coffee or at restaurants that offer discounts through the program. Anyone can view the offers and discounts on Rotary Global Rewards. But only Rotary club members who are signed into their My Rotary accounts can redeem them. You can access and redeem rewards from your computer, smart phone, or The first step is to go to Rotary.org and click on My Rotary to establish a My Rotary account. If you already have a My Rotary account you can use your existing account ID and password. On your web browser enter: "Rotary.org/globalrewards"
You can simply do web search (with Google, Yahoo, etc.) 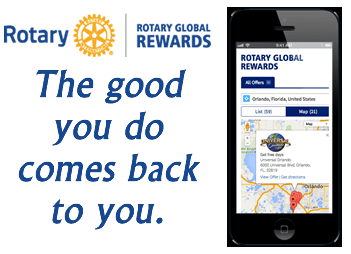 for "Rotary Global Rewards"
Once you are in your Rotary account, through the Member Center, clicking on "Explore Rewards" underneath the Rotary Global Rewards featured link. Once in, Rotary Global Rewards, you will find links to Frequently Asked Questions, and how to find deals on either a mobile device or your desktop. In "Explore Rewards", you will find a listing of all available discounts. By clicking on "Category", you are able to narrow your search down to specific areas, such as entertainment or travel. Offers may also be viewed on a map that shows the locations of available discounts that are nearest to you. Finally, you can also use search to find vendors. There is list of vendors currently available on Rotary Global Rewards under "Resources and References". If you still have questions, help is available at 1-866-976-8239. You will find this new program will provide you many rewards as a bonus for all you do in Rotary service. Please access Rotary Global Rewards as soon as possible and encourage your fellow Rotarians to as well.